Dr. Lucien Howe Five Hundred and Twenty Delaware Avenue Buffalo, N.Y. February 10, 1923 Dear Dr. Davenport and Dr. Laughlin, Thank you for the comments made by you and Dr. Laughlin. Of course they were read with unusual interest. After obtaining views from so many different standpoints it was evident that it would be practically impossible to formulate a law to suit everyone. Like most legislation it would be the result of compromises. I thought, though, the present form would accord with your ideas. It was practically the same as that which we had thought of presenting to the International Congress and which Dr. Laughlin and I had discussed with Prof. Chamberlain. 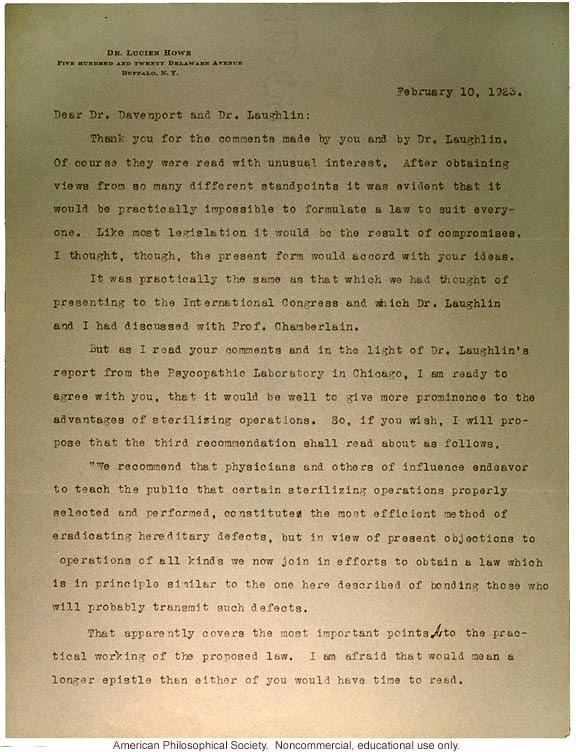 But as I read your comments and in the light of Dr. Laughlin's report from the Psycopathic[sic] Laboratory in Chicago, I am ready to agree with you, that it would be well to give more prominence to the advantages of sterilizing operations. So, if you wish, I will propose that the third recommendation shall read about as follows. "We recommend that physicians and others of influence endeavor to teach the public that certain sterilizing operations properly selected and performed, constitutes the most efficient method of eradicating hereditary defects, but in view of present objections to operations of all kinds we now join efforts to obtain a law which is in principle similar to the one here described of bonding those who will probably transmit such defects. That apparently covers the most important points to the practical working of the proposed law. I am afraid that would mean a longer epistle than either of you would have time to read.